Much of the news today was around Facebook's 10% month-over-month decline in unique users - but the search query data out of Comscore is equally interesting (and important, particularly in light of the Microsoft-Yahoo deal). Google gained nearly two points in search share - now representing 61.6% of US search queries. 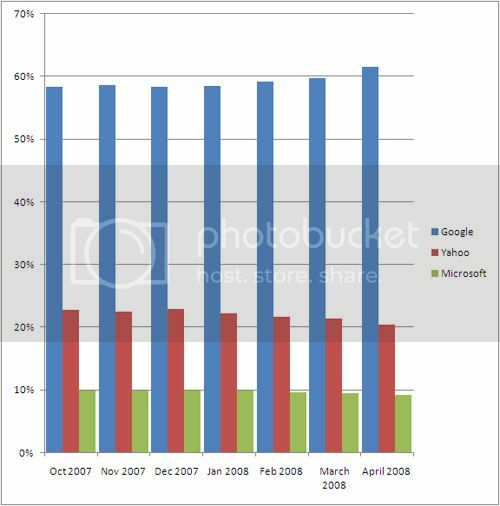 Google had sat around the 58% mark from October - December of 2008 and surged in April (breaking 60% for the first time). Meanwhile, Yahoo fell nearly a full point to 20.4%. Since January, Yahoo has falled 2.5 points (11%) compared to Google's 3 point gain (5.3%). As Yahoo attempts to remain independent, their rapidly declining search share does not bode well or instill confidence.